4th annual Run 4 tHe Revolution 5K and Clover Trot 1K Fun Run. 8:00 AM ET 5K / 9:00 AM ET 1K. Lake Park Elementary School, 604 W. Marion Avenue, Lake Park, Georgia 31636. 2013 story. 2012 story. Online registration at EventBrite.com. FSU Disability Student Union 5K. 10:00 AM ET. Florida State University Integration Statue, Woodward Plaza, Tallahassee, Florida. Event page on Facebook. Sarah Teitelman, AccessForNoles@gmail.com. Project Graduation Shamrock Shuffle 5K. 8:00 AM CT. Sneads Park on Lake Seminole, 2399 Legion Road, Sneads, Florida 32460. 2011 story. Event page on Facebook. Entry form and flyer. Edna Reed, 850-209-8391. Walk to Talk 5K. 9:00 AM ET. Tallahassee-St. Marks Historic Railroad State Trail trailhead, 4778 Woodville Highway, Tallahassee, Florida 32305. Online registration at active.com. 6th annual Peanut Proud 5K and one-mile fun run. 8:00 AM ET. Funny Girl Deli, 146 Court Square, Blakely, Georgia 39823‎. Jay Winkler, 229-225-7213. 3rd annual Tift County Schools Relay For Life Spring Fling 5K and one-mile fun run. 8:00 AM ET. Eighth Street Middle School 700 W. 8th Street, Tifton, Georgia 31794. dbrown@tiftschools.com or 229-387-2445. Cure Duchenne 5K. 9:00 AM ET. Ivey Memorial Park, 614 Ivey Memorial Park Drive, Branford , Florida 32008. Online registration at active.com. Karen Koon 386-935-5615. 2nd annual Sole-2-Soul 10.1K and 5K. 2:00 PM ET 5K / 3:00 PM ET 10.1K. Albany Christian Church, 1501 Whispering Pines Road, Albany, Georgia 31707. Entry form and flyer. Online registration at active.com. Braden Miller, sole2soul5K@albanychristianchurch.com or 229-395-1170. 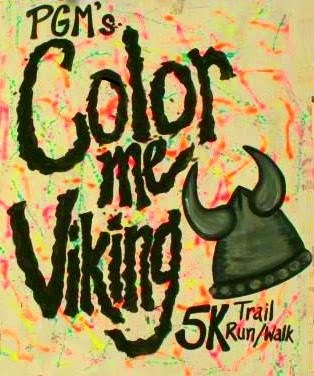 I can imagine a series of careful calculations going into Valdosta, Georgia's Pine Grove Middle School's plans for the Color-Me-Viking 5K. Let's put on a run. What's the most popular distance? 5K? Okay, we'll do one of those. Trail runs are big right now. We'll run cross-country behind the school on Pine Grove Farm. Color runs are hot. Let's make it a color run. That conference only exists in my imagination. But when Pine Grove Middle had about 200 people finish their first-year race on 22 February 2014, it was the size of crowd that made you suspect there had been some market research. The fastest of the crowd was Dylan Rogers, a freshman member of the cross-country team at Lowndes High School. Rogers ran 18:25 over the 3.1-mile course. Nathan Crews, another runner on the Lowndes High cross-country squad, finished runner-up in 18:57. Elijah Boyd was third in 19:46. Despite of all the youth up front, there were also some older runners in the race. Valdosta's Jeremy Storey was the top male master, placing 13th overall in 21:48. Angel Godwin was the fastest master woman, 55th overall in 27:27. Proceeds from the race went to benefit the athletic department of Pine Grove Middle School. Reed Bingham State Park opened in South Georgia near Adel during 1958, but before then the vultures were already visiting the area each winter. Runners began annual visits some time after the park was established, but still more than a few years ago. 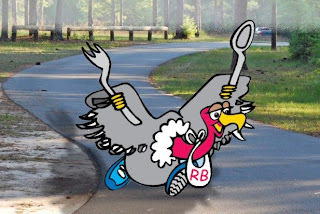 In addition to being newcomers compared to the vultures, the runners weren't as consistent. Sometimes they came in February, sometimes in May. Sometimes they ran a 10K, sometimes a 5K. Sometimes they ran on the trails, sometimes on the roads. Whatever the date or distance, they came for Road Kill Run. In 2014, the Road Kill Run was held on 22 February after two years of May race dates. As in the previous two years, the race was a 5K on USATF certified course GA11076WC. This time around Ryan Kelly--the Valdosta Middle School cross-country coach from Lake Park, Georgia--won the race, posting a time of 18:51 for the 3.1-mile tour of the park. Adel master runner Sean McConnell finished second behind Kelly in 19:34. Another master runner, Bret Wagenhorst of Tifton, Georgia, was third in 20:32. Ray City, Georgia, athlete Makenzee Page finished fourth overall, winning the women's competition and setting a new women's course record of 21:25. Lakeland, Georgia, master runner Tammy Hatton was the women's runner-up, placing 12th overall in 29:21. 33 athletes finished the 2014 Road Kill Run 5K. The race is conducted by the Friends of Reed Bingham State Park for the benefit of the park. Finish line and timing services were provided by A Course/Line, LLC of Valdosta, Georgia. 2013 story, "Roe and Wilkey make their rivals look like buzzard bait"
2012 story, "Avenger and Cherry leave 'em behind for the buzzards"
The 2014 Winter Olympics are over, and I can't say I miss them. The "Olympic movement" in general is a steady source of disappointment for me. Yes, I've accepted intellectually that the ancient Games were a festival to Zeus, and the modern Games are a festival to Mammon. Emotionally, though, I keep expecting pure and simple heroics, like Emil "The Iron Czech" Zatopek's 1952 triple, or Herb Elliot's front-running 1960 1500 meter victory, or Dave Wottle's thrilling win at the tape in the 800 meters in 1972. So I get to be disillusioned over and over again. The Winter Olympics underscore most of what I dislike about the Games. A while back the Winter Games were re-scheduled to fall between the actual Olympic years; there's more sponsorship dollars to be had that way. All the sports require you to live way too close to the Arctic Circle, or have access to expensive facilities, or both. You won't hear many stories about poor kids from the Ethiopian countryside beating the odds to become gold medalists in downhill skiing. This isn't the Summer Games. This is the Rich White People's Olympics. About five years ago, it was proposed that cross-country running be added to the Winter Olympics. This would have put a more universal sport on the program, or at least something that I was actually interested in watching. Cross-country had been in the Summer Olympics in its own right as late as 1924, and as part of modern pentathlon until 2008. Adding it to the Winter Games made a great deal of sense. So naturally, the International Olympic Committee didn't do anything about it. Maybe they were discouraged by the cost overruns in Sochi. But where the Russian Federation couldn't put on a Winter Olympic cross-country run, the citizen of Dothan, Alabama, could. 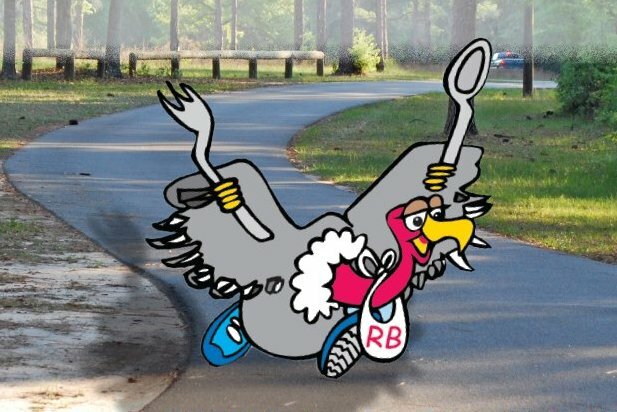 The Larry and Ronna Dykes Trail in Westgate Park may not have cost the $51,000,0000,0000 that Russia spent on the Sochi Games, but the path in the park was sufficient for the Winter Olympics 5K Trail Run hosted by the Dothan Runners Club on Saturday morning, 22 February 2014. Donalsonville, Georgia, master runner Myles Gibson was the gold medalist in the event, winning by over half a kilometer in 18:43. Ten-year-old Alan Flores of Dothan finished runner-up in 20:59. Dothan master runners Mike Houston and Dale Thomas were third and fourth in 21:08 and 23:40. On the women's side, gold went to Larissa Collier, who was tenth overall in 23:56. Finishing in the silver medal spot was Amy Schutz, thirteenth overall in 24:38. Brandi Mitchell took the bronze-medal spot in the women's division, coming in fifteenth overall in 24:47. Kristina Bennett was the first woman master and fourth woman finisher, placing 17th overall in 25:55. 67 athletes finished the Winter Olympics 5K Trail Run. The event seemed decidedly un-Olympian, because there were no drug tests, anti-terrorist measures, or members of the International Olympic Committee looking for a payoff. I don't see anything wrong with that, though. "Cross Country, the Once and Future Olympic Sport"
The first of a crowd of nearly 500 runners to finish a 3.1-mile loop around Florida State University's Tallahassee campus, Zach Deveau won the 2LT Justin Sisson Memorial 5K on Saturday morning, 22 February 2014. Deveau's time in the first year race was 17:38. Michael LaBossiere led the master runners, finishing seventh overall in 19:49. FSU senior pre-med student Kate Harrison was the first woman finisher, coming in ninth overall in 19:51. At 24:14 Fran McLean was the first woman master. The race started just after 9:00 AM on Honors Way, next to Landis Green. The runners were tested early with a climb up Gallows Hill to Westcott on Copeland Street. By the end of the first kilometer, Peter Kaus was leading the field west on Jefferson Street. Adam Greenstein followed a few strides back, with Zach Deveau just off his shoulder. A kilometer later, at the Jefferson Street-Varsity Drive roundabout, Deveau had caught up with Kaus, leaving Greenstein behind. With Greenstein fading, the fight was now between Deveau and Kaus, and Deveau scored a knockout during the third kilometer, opening up a 60-meter lead. The gap only got wider on the way to the finish line, which Deveau reached first in 17:38. Kaus was second in 18:28, with Greenstein third in 18:50. "5Ks are tough. I'm used to marathons," said Kate Harrison, shortly after winning the women's title at the Sisson 5K. Harrison is certainly no stranger to the marathon, having run well in the last two Tallahassee Marathons, as well as 26.2-mile runs at the end of Iron Man triathlons in Panama City and Kona. However, if the Sisson 5K was tough for Harrison, she made it tougher for her competitors. By the end of the second kilometer, Harrison was ahead of all the women in the field, with only Renee Cox keeping it close, trailing by a single second. Harrison got away from Cox late in the race, though, running home in 19:51. Cox was second in the women's standings, 11th overall in 20:05. FSU economics professor Katie Sherron was the third women finisher, 17th overall in 20:39. The race was hosted by Students For America's Military in honor of Justin Sisson, an alumnus of FSU's Army ROTC program who was killed in action in Afghanistan on 3 June 2013. The first-year race was chip-timed, with results for each of the 475 finishers posted on-site. Book It! 5K. 10 AM ET. Florida State University Westcott Building, 222 South Copeland Street, Tallahassee, Florida 32304. Event web page. Online registration at EventBrite.com.